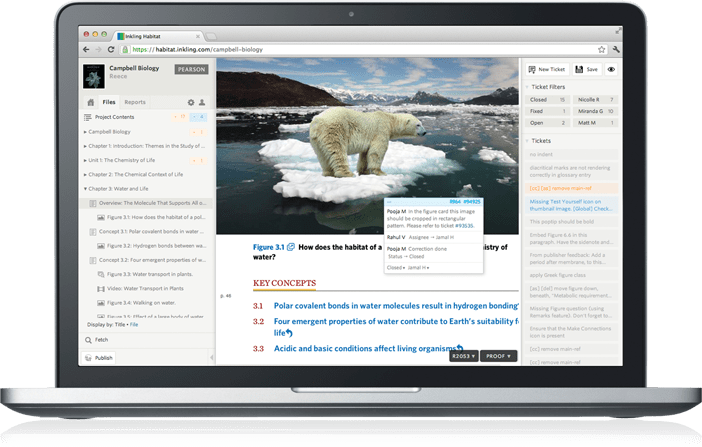 Earlier today Inkling launched Habitat, the new textbook creation tool that I told you about last week. I still haven't seen it in person (Inkling has been ducking my emails for a week and a half), but it does sound interesting. Habitat is a web-based pro tool for aassembing content into textbooks. Right now it makes ebooks for Inkling's app and for new browser based app that Inkling should launch soon. Habitat is free to use, and Inkling will be taking a cut of the sale. It's not clear from the news reports, but it looks like Inkling is planning to move beyond their iPad app. The browser based app is likely HTML5 based and possibly the first step towards more apps. Last week I referred to Habitat as an iBooks Author competitor, and it looks like I was slightly wrong. Like iBooks Author, Habitat was built for the publisher audience, but it also offers the chance to build a richer format. Habitat includes far more options for interactivity, including quizzes (something which some reviewers have noticed lacking from iBA created textbooks). Habitat is also more robust than iBA and is designed so multiple team members in multiple locations can collaborate on a textbook. Habitat grew out of Inkling's own internal tools, and it's in use now. Aptara and Innodata have been part of a beta test program, and Inkling plans to expand the user base to include more publishers over the next few months. Interested readers can register for the Early Adopter Program here. P.S. I wasn't able to ask the questions I wanted (Inkling refused to talk to me), so I'll post them here. These re some of the things that I don't think were clearly answered in any of the articles about this story. Can I export my content and take it elsewhere? How difficult is it to make custom interactive content, and can Inkling develop it for me? What are their plans for apps and platforms beyond the iPad? What about textbooks that interact with external components (sensors and the like)?